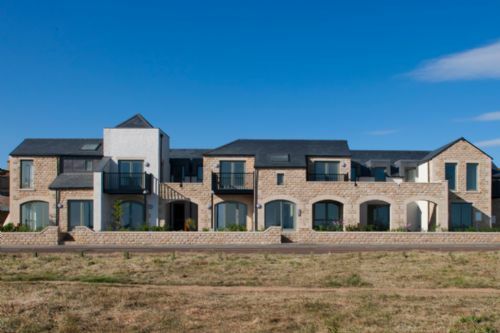 Upper Deck is an East facing apartment in the prestigious Seafield Development on the sea front in Seahouses. With stunning views out to sea, to Seahouses Harbour and directly to the Farne Islands, its location could not be bettered for those who wish to holiday in a property close to the village facilities with the added attraction of a fabulous view point from which to while away the hours watching the world go by. 1st floor apartment, its finish, furnishings, layout and those fantastic views. 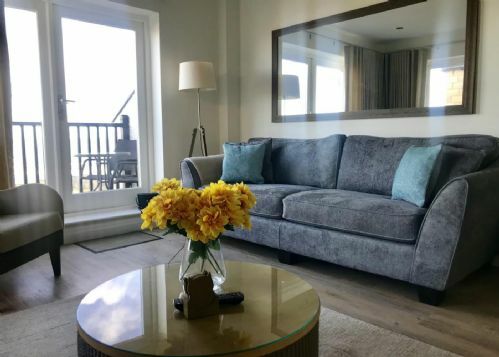 Dining kitchen well equipped and finished, together with a lounge area and balcony, designed to take advantage of stunning views: directly over open sea to the Farne Islands and south east overlooking the busy Seahouses Harbour. Upperdeck comfortably sleeps up to 4 people in two ensuite bedrooms (one with bath, one with shower), both rooms having beds which will be set up as Super King Doubles, though either or both can be requested twins if preferred. The master bedroom also has sea views. An infant in travel cot can also be accommodated. The finish and decor of the apartment is of the highest quality, designed and implemented by the owners cousin who is an interior designer. Linens and towels are from "the White Company". A security protected communal front door leads to a staircase to the first floor, where the apartment has its own front door. Bedroom 1 is en-suite with a bath with shower over. Super King bed which will be set as a double unless specifically requested to be a twin. Bedroom 2 is en-suite with a shower. Will be set as a twin unless specifically requested. Both bedrooms come with ample storage space. At the rear of the property is a bright and airy kitchen dining room with balcony, which benefits from the evening sun. 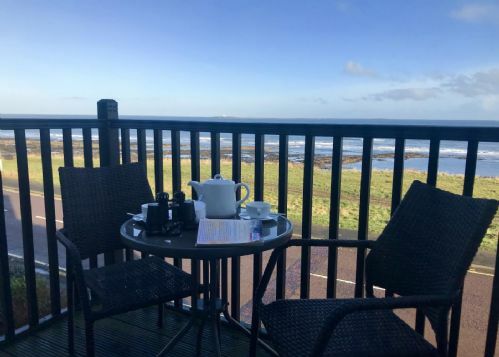 The property has two private balconies - one to the front overlooking the rocky shore (great for rock pooling with or without the kids) towards the Farne Islands, and one to the rear off the kitchen dining room, making the most of evening sun. 1 lockable storage unit on car parking level - great for storage of cycles or other leisure gear. All bedding, bed linen, towels, electricity and parking for 1 car are included in the price. 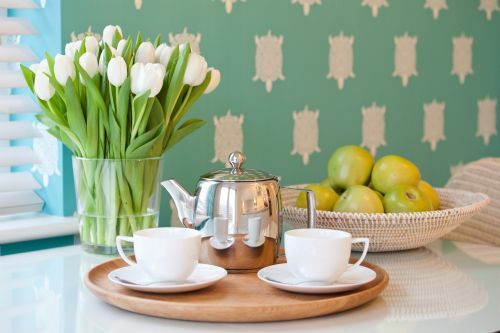 A complimentary supply of tea, coffee, milk and sweet treat will be provided as a welcome when you arrive at the property. A full list of welcome kitchen and toiletry supplies is available on request. Netflix, viewable on smart TV - enables you to make a choice of films, TV programmes and shows over and above Freeview channels, plus you can bring your smart phone, tablet, game station or lap top and plug in, therefore we do not provide a DVD player. 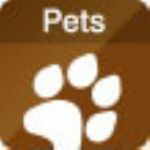 1 well behaved small non-shedding dog welcome? Upper Deck's electric heating and hot water systems are supported by, but not soley operated by, Solar panels. A travel cot & high chair are available but must be requested on your booking prior to arrival, please add to the comments box when online booking, or ask when making a telephone booking. A starter selection of toiletries will be provided. A kitchen welcome pack is also provided. This property can be booked with Portside which is next door for a further 4 people in one great location. 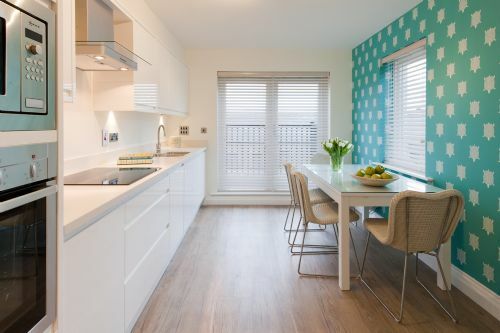 Each apartment has been set up to enable up to 8 dining together. A good housekeeping bond of £150 is required to be lodged during your stay at this property. 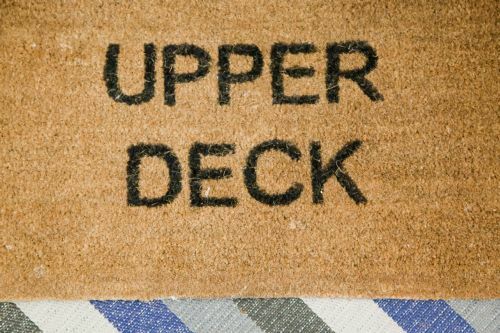 Children are welcomed at Upper Deck, though be aware that this is a first floor apartment with a balcony deck. 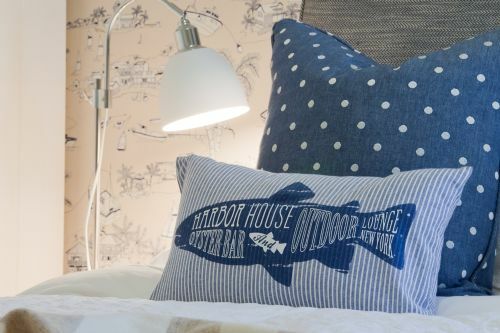 Short breaks of 2,3, 4 nights when available are usually calculated at 80% of the weekly rate, however there is a minimum booking price of £435. Our 4th visit to this fantastic accommodation, and we hope to return again! Beautiful walk along to Bamburgh and also the beach at Embleton is a must! Yet another great time. Our dog Lucky loved her bag of treats. Great location and visit - we are all looking forward to coming back again! Superb location, apartment so lovely and clean, well equipped and the views are not bad either! Another super week, usual walks - especially to Bamburgh along the beach. Superb weather allowing the wonderful views from the apartment and us to enjoy plenty of coastal walks. The pages of the sea event on Remembrance Sunday was an added bonus to our stay. We will certainly be returning for another stay! Had a great first visit here - thanks! Great quality accommodation and the best location we could have wished for - these views are priceless! Never needed to take the car out once here. Thank you and would love to come back. Another great visit, been coming to Seahouses for 7 years. Beautiful location! Looking forward to coming back at New Year. Our first trip to the area. It is stunning! Enjoyed the run along the beach and back to Bamburgh Castle. 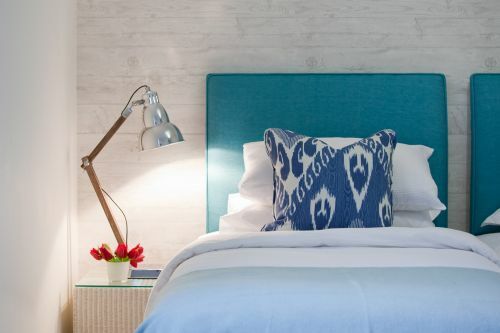 Comfortable, clean and modern fun flat with a wonderful view of the ocean. Great views near town where you can walk to restaurants and grocery. Kitchen has everything you need. Go to Alnwick you will not be be disappointed. Take a whole day and enjoy town too.. Also Holy Island and Bamburgh are very interesting. Hope to come back one day and stay here again. Having previously stayed in Portside last year, Upper Deck lived up to all expectations - clean and comfortable, well equipped and well thought out. Views amazing - loved watching too and flow and the tides on the rocks, the boats off to the Farne Islands and other craft coming and going. We think we might be back at some time! Thank you for a lovely stay. Really good week, weather great, lovely apartment, Seahouses is a great base! Another fantastic week. Apartment excellent with all we needed. Loved Bamburgh beach and Beadnell beach, (all facilities and east access to beach). Great sunsets and skies at night. Enjoyed our stay at Bega's Bead. A lovely base for exploring the area. Nice walks along the beaches in both directions as well as at Low Newton-by-the-sea. Thank you for a lovely week. What a fabulous stay here in Seahouses. Can't fault the apartment! Its spotlessly clean, well equipped and so nicely decorated - very comfortable! Great location for us and plenty to do in the local area. Would reccommend! Fabulous apartment. Spotlessly clean. Beautifully decorated and easily walkable into Seahouses shops and restaurants. Would highly recommend. Lovely apartment with everything you need for a relaxing holiday. Love the big superking beds - really comfy! The views are wonderful and just a short walk to the harbour and shops. Really appreciate the little extras, like shampoo and shower gel, a proper hair dryer - a real home from home. Plus, it's great to be able to bring our little dog along to a family break, thank you. Once again another fabulous stay! Spotlessly clean apartment with superb views. Wonderful coastal walks in this beautiful location. Excellent apartment, spotless and every need catered for in the kitchen and both en-suites. Amazing views, even when snowing and hailing! Lovely and warm during the second "Beast from the East" and fantastic to see the sea in every mood! Ideal position, so near to the harbour and village, but quiet too! Will recommend to family and friends. We have had a lovely and relaxing stay. Views fantastic, apartment fantastic and clean. Would definitely come back. Our 2nd stay in Upper Deck - just as good as the first! Really appreciate the standard of everything and the view is wonderful to wake up to every morning and enjoy all day long. Also very much enjoyed using the gym, classes and pool at the Ocean Club. Planning our next visit already! A wonderful stay in a fantastic apartment. Excellent views! Will return soon! Excellent accommodation, lived up to expectations. Wonderful views from balcony. Thank you. First class accommodation. Spent a lot of the week exploring the wonderful sandy beaches even though the weather was blustery showers some of the time! Barter Books in Alnwick - 10,000 of books and a great restaurant in an old railway station waiting room. Plenty of restaurants in Seahouses, so much to choose from. Boat trip to Farne Islands was excellent, not many birds at this time of year but we say loads of basking seals. Wonderful week - coastline exceeded expectations. Weather held up well. Flat is very comfortable with everything and more we needed (good knives were a bonus!) hope to return. Thank you. Our 3rd stay in the Upper Deck apartment, since 2015. As always they are beautifully kept and equipped. Such a lovely site, and everywhere is nearby. Such a good location, look forward to our next visit! This is our second stay in Upper Deck and still as fantastic as the 1st. Lovely with the weather and we will return. The views from the apartment are fantastic and will recommend this location to anyone. Fantastic week we have had at Seahouses, lovely views and nice weather all week (but two days of light rain). We have had a relaxing week exploring the coastline and Northumberland. The apartment is first class, lovely clean and tidy. Would come back again without hesitation! What a fantastic week we've had exploring the Northumberland Coastline, which is beautiful, even in the rain although we haven't had much of that. Our evenings have been spent relaxing in this wonderful apartment watching the sun go down with a glass of wine on the balcony - bliss. We will return and recommend to our friends. Thanks for a fantastic stay, the apartment is just what we like. Even though it rained cats and dogs the first two days, but it was a pleasure to enjoy this lovely apartment, just like being at home! The rest of the week visiting all the beautiful places! Now sadly we have to go back to Switzerland, but will definitely will come back. Special thanks for the all the little details for our little doggy friend. 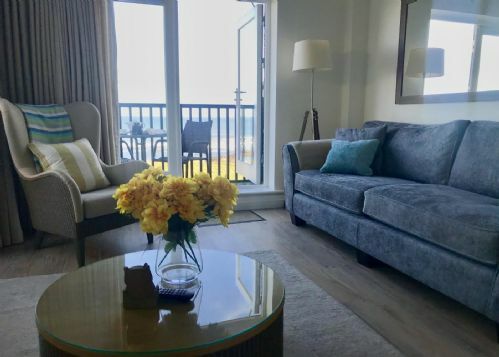 We were very happy on arrival with the beautiful apartment and stunning location and sea views! 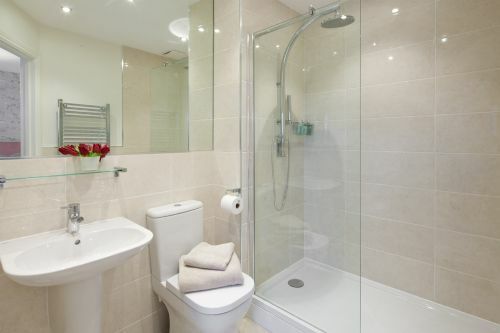 A perfectly kitted out apartment to make anyones stay an easy and convenient one, with everything you need down to the little touches such as dishwasher tablets, washing up liquid and hand soap! A wonderful holiday, we will miss that view! We would definitely stay here again and I would highly recommend it to anyone visiting the area. Thanks for providing a lovely, comfortable apartment with wonderful views of the Farnes, Bamburgh and even Lindisfarne from the balcony! We had some spectacular sunsets which were easy to photograph without leaving the flat! This is our umpteenth visit to Northumberland, we felt this was an excellent base for us and it was close enough to shops and restaurants without feeling too busy around us. The two balconies worked well, with the sun hitting the front in the mornings while the back one was great for a bit of sunbathing later in the day, with more privacy. Definitely a great place to unwind. Beautiful flat in an amazing location. Stunning views of the Farne Islands. Had some delicious meals from some of the restaurants in Seahouses. Netflix came in very handy when the weather was awful! Hope to stay here again. 10/10! Excellent apartment with very good facilities and a brilliant location. Weather was mixed but we really enjoyed our stay. Virgin trains from Alnmouth/Alnwick took us to Edinburgh for a day trip. Locally Swallow Fish sell a whole range of fresh fish products. Would love to come again! Apartment - first class and exactly as advertised. Lovely base from which to explore. Enjoyed all the local pubs and friendly landlords! Not a bad meal, Elan Pizza was excellent! Bus service great, worth the fare to Berwick. Great apartment to stay in. Our second visit and just as fabulous! Food superb - back to Insieme (the Italian) in Seahouses for a fabulous meal and service. For afternoon tea we went to the Running Fox Bakery in Felton - suburb. Howick Hall and Gardens is also beautiful, very different to Alnwick and much preferred! Will visit again next time as its huge! Weather a bit of a mix, but stayed dry and most of the week the sun shone. Was my 1st visit, lovely views and a lovely friendly place. Definitely recommend, couldn't fault it! First visit to Upper Deck but have stayed in the area for many years through Stay Northumbria. Housekeeping excellent as ever and apartment really thoughtfully kitted out - with plenty of plug sockets in the right places, which is quite rare! The view is spectacular and we look forward to returning later in the year. Our first trip to the area. Lovely walk from Craster to Dunstanburgh Castle and around. Fabulous apartment. This was our first visit to the Northumberland area. What a wonderful apartment, very well equipped and the view is amazing. Can't believe all the great restaurants in Seahouses, spoilt for choice! Everything we could ever want and more! We've been to Seahouses many times before but never stayed before. This time it was for our Honeymoon!! Thank you for making it so special! We'll be back soon - if you'll have us! Great apartment in a great location with fabulous views. We had a great time and will highly recommend to anybody interested in coming to Northumberland. Had a great week at Upper Deck. The weather was very kind to us as we love walking. Upper Deck was really nice and very comfortable. Hope to be back sometime. Thank you for a fantastic week and Upper Deck, our first visit to the Northumberland Coast. Lots of highlights; Barter Books in Alnwick, Alnwick Gardens and Castle, the peace and beauty of Holy Island, the cicular walk to Bamburgh using St Oswald's Way and the beach, Cragside near Rothbury and the walk from Caster to Dunstanburgh Castle. Sadly, the gusty wind did not allow a trip to the Farne Islands, but the view of them from the window was ample consolation, especially with the binoculars provided. St Aidan's Bistro, in stumbling distance of the front door, was the pick of the restaurants in Seahouses, but we also thoroughly enjoyed pizza a Elan and Sunday Lunch at the Links. Hopefully we'll be back before too long. A fantastic stay with the New Year to celebrate. Very windy and cold but the children enjoyed the relaxing stay. A visit to Bamburgh Castle and then back to Yorkshire. We wil be back! Molly and Harrison can't wait! A fabulous first trip to Northumberland and hard to leave the beautiful apartment! Weather was 15 degrees when we arrived and 4 degrees when we left! At this time of year check catsle opening times before you go. Bamburgh was fabulous and a walk to Craster to the ruined Dunstanburgh was great. Alnwick Garden is nice - walk into town, Barter Books worth a look. We loved the Old School Art Gallery and cafe at Alnmouth. Enjoyed a walk around Amble. We loved Bertrams at Warkworth (we'll be back to do the castle). I walked from th apartment to Beadnell, the must-see is the limekilns. I spent sometime here on my own and felt safe and secure. Having stayed in Portside previously we knew we would enjoy our stay but we must admit we prefer the views that Upper Deck has to offer. What a fabulous place! Immaculately clean and very well equipped. A couple of lightbulbs went and a lovely lady from the management company came out within the hour with replacements. We love Seahouses and have been many times. We will certainly be back to Upper Deck. WOW! What a beautiful apartment. WOW! What a beautiful part of the country. Lots to do and plenty to see - could do with another week. Had lovely walks along the beach. Visited Bamburgh Castle, Holy Island but the high point of our holiday was visiting the puffins and seals on a boat trip to/around the Farne Islands - would highly recommend. Would love to come back. Another great week at Upper Deck. The flat is perfect for our needs. Close to town but far enough away to be peaceful! For future guests- would recommend a visit to Alnwick Castle/Gardens. At low tide a walk to Bamburgh along the beach, either walk back or catch the bus (after a beer at the Lord Crewe of course). Restaurants - Insieme Italian is very good, the Brasserie, best Indian and Pinnacles for best fish & chips. We hope to be back! Very much enjoyed a week in Upper Deck. Congratulations to whoever set up the apartment everything has been so thoughtfully organised. Would recommend two trips to the Farnes on Serenity 11 and 111 one to inner Farne and the evening cruise. Will return. Fab apartment, very comfortable. relaxing stay. We had a great day at Bamburgh, new owners at the garden centre - well worth a visit.Thanks for a lovely week in your brilliant home. Another great holiday in Upper Deck. We saw the dolphins again! What an impressive apartment . Brilliant views. Comfortable. Everything well organised, clean & tidy. So well thought out. Whatever we needed was here! We love this place! Fantastic apartment with the most amazing views & we've never stayed in such a well stocked place - all the little touches like the toiletries, lightbulbs, toilet rolls & starter pack plus even the local weather maps left out for us were such nice touches. We've never been to this part of the world before & loe this AONB -fab coastlines, loved the Farne ISlands & Bamburgh beach, Holy Island, Alnwick,etc. Great recommendations from Millingtons (Cheshire) Aug 2014. Agree with all the comments about the very tastefully decorated Upper Deck - v cimfy beds, loved the seaside themed colours & furnishings. Will definately recommend & plan to return as too much to see & do in 1 week. Very clean & comfortable apartment with lovely view. We enjoyed it very much. Wonderful & fantastic apartment, great views & beautiful sunset. We had a lovely holiday and will be staying again. Thank you. A fantasic week and look forward to returning. Had a wonderful and relaxing holiday. The apartment is absolutely fantastic. The view is fantastic.The walk to Bamburgh Castle is amazing, really reccomend it. We will definately be back. A wonderful apartment, so rare to stay somewhere that looks like the pictures on the web! The views from the balcony out towards Bamburgh are stunning. Thank you for a wonderful break. Two oldies staying with multiple health problems needing a complete break by the sea and we found it here. The views are sublime even at this time of year - it was sunny when the south of England was suffering from storm Imogen! Did use the Ocean Club as unable to get the long walks along the beaches that we used to. Lovely trip to Cratser for a pub lunch, overlooking the sea. The decor in this place is superb too. Well thought out, luxurious & truely relaxing colour schemes. Beautiful relaxing space - views of the sea were heaven to wake up to. Thanks for a fabulous stay. Excellent apartment. Beautiful beaches. We love the area. Hope to return. Thank you for a lovely week. Apartment very comfortable and well equipped. View over the sands to Bamburgh gorgeous on a sunny day, especially with a red sky at sunset. I'm sure we will be back. Extremely comfortable and well equipped accommodation. Having visited Seahouses/Bamburgh regularly over the last 20 years we still think there is nothing better than walking over the sands to Bamburgh. We will return. Fantastic apartment which more than lived up to our expectations - comfort, views, well equipped and home from home. Enjoyed exploring the coast of Northumberland and certainly hope to return to take advantage of cycle routes and play golf. Rally enjoyed our holiday! Beautiful, comfortable apartment with stunning views. First time in Northumbria and we loved it. Left early for family reasons but had a great time. Lovely apartment, fantastic views. No faults found in accommodation. Recommend walk along the beach to Bamburgh Castle. Overall had a lovely holiday! We agree that this is a lovely apartment, well equiped and with excellent views. we visited the castles and Cragside - well worth a visit but very busy on the Tuesday when we visited. We have tried several restaurants in the area and would recommend the following - Old Ship - boook ealry, the Spice House - best Indian, The Bistro at St Aidan Hotel - quite pricey but excellent food and service, and last but not least if you like Italian food Insieme, tucked away at th rear fo the Main Stree, excellent. Had a wonderful holiday in a superb apartment with wonderfulviews. A superb week in this beautiful apartment. Enjoyed the fabulous views and delightful beaches. WOW! I've just woken up from A dream and been on holiday in the North East of England; the sun was out, warm temperatures and not had to get a passport! Guess what, them told me it would be wet and windy, wer wrong apart from one day, but went to Cragside which was well worth a look. You'll love it here, ther's too much to do and plenty of time just to do nothing and enjoy the view of the Farne Islands, got to admit it's pretty spectacular. We will come again and try and finish off what we missed off. Accommodation is brilliant and tell your friends to book up as well. This is a must: Villages in Time do a great guided walk and knows a bit about the area, so try Mik on Facebook & do it! Well done Stay Northumbria the apartment 'were Bostin'......(brilliant)! Excellent location with wonderful views. Well appointed apartment. Great week in a wonderful part of the country. Superb apartment! on our first morning sat on the balcony looking out to sea. We were delighted to see a pod of dolphins. What a start to the holiday! The walk along the beach to Bamburgh is well worth the effort, also the boat tripto the Farne Isalands. Craster is an interesting place, with a splendid walk to Dumstanburgh Castle. The Craster Skink soup was amazing! The Old Ship Inn in Seahouses was our favourite place to eat, down to earth food and very friendly staff. The apartment is furnished to a high standard and very well equiped. We will return! On approaching the apartment WOW was the word - the location and views superb. The apartment was well furnished, clean and comfortable. Exploring eas easy and in reach of most places. The Farne Isalands was a day well spent with all the sea birds. Lindisfarne and learning a bit more about Grace Darling and visiting the museum was wonderful. I think the best find was the pub in Low Newton. Will return to the area at some stage. If you are reading this then you are the next people to have said WOW as you entered the apartment. Yes, what a view from the room window/door, yes it really is :) The apartment has everything you could want for a stay short or long. The weather was very good, blue sky & sun with slight cool wind. Well that's it, time to pack for jpurney home so enjoy your stay at Upper Deck No7. A lovely modern well equipped apartment. The best we have stayed in. The views from the balcony are superb. 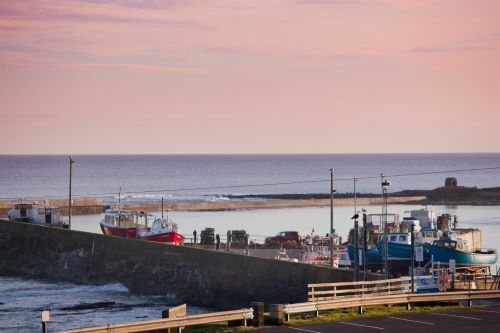 We bought the local kippers at Swallow Fish in Seahouses - so good we went back twice! The beach/coastal walk from the door to Bamburghh Castle is well worth it. We also drove to Embleton and walked to Craster, taking in the ruined Dunstanburgh. Alnwick Castle is fantastic but not so great in the school holidays. Our favourite place was Cragside - a great day out in gorgeous surrounds. Our third time in Seahouses and this place has spoiled us...not sure we can stay anywhere else now. Beautiful Apartment with fabulous views. It's been truely magical for our honeymoon. We've enjoyed the usual places: the ale at the Olde Ship, the excellent food and ale at The Shi[ at Low Newton, great seafoos from Swallow Fish and Craster. A few new finds this time too: Howick Hall and Gardens is fabulous for walks, lunch and history, Warkworth Castle and of course the Farne Islands. Serenity 11 worked very well of one who suffers from deasickness, a very stable catamaran with a landing on Inner Farne. The Puffins were brilliant. We will almost certainly be back. Thoroughly enjoyed our stay at this lovely apartment and will long remember the beaches and castles of Northumberland. A superb apartment - thank you very much indeed. We enjoyed a lovely week in the area (despite a broken leg on day2 - what a view for resting!). Enjoyed lovely meals at The Kinks Hotel, Bamburgh Castle Inn & Victoria Inn (Bamburgh) and great family time at Alwick Castle. Apartment was super-comfy with everything we could possibly need. Hope to be back one day! A lovely week in a fantastically comfortable apartment. I was very impressed with the quality of all the fuxtures & fittings. The location is simply superb and we are seriously considering a second visit in July! Thank you for the lovely quality, we loved the nice clean white bedrooms. We loved the view out to sea and the weather was really good. Wonderful location very unspoilt and easy access to all we wanted to explore which we have done most of will maybe have to return to do more. lots of walking and eating out having excellent food. Apartment very very comfortable and well equipped not that we have done much cooking and certainly no washing (no time to waste doing these things). lovely little break in a place we perhaps should not mention too much. Thank you. What a pleasant surprise to arrive at such a beautiful apartment, in an area that is so different, and hidden from the busy area of Northumbria. So many options to please the tastes of everyone, it is hardly worth mentioning by name, as to 'find' your own way is probably the best option. The views each morning and evening from this superb location varied day by day, and was so relaxing - A very fine apartment, and would love to return. Another lovely week in Northumberland - we don't want to leave. Although the weather wasn't great there's still plenty to do - walks, pub lunches, boat trips, Alnwick, Warkworth, lovely beaches. 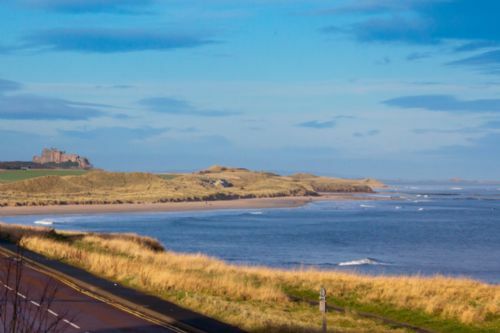 Our annual sunset watching place is at the end of The Wynding in Bamburgh by the golf cours - alovely drive down, then at the end great views over Budle Bay & Holy Island. Each sunset is different! Really lovely apartment, wonderful scenery. Greta walk along the beach to Bamburgh (got the bus back!). Lord Crewe Hotel in Bamburgh lovely for lunch or dinner. Indian Brasserei in Seahouses well worth the money for take out or sitting in. Alnwick Castle and gardens well worth a visit. One week never enough. 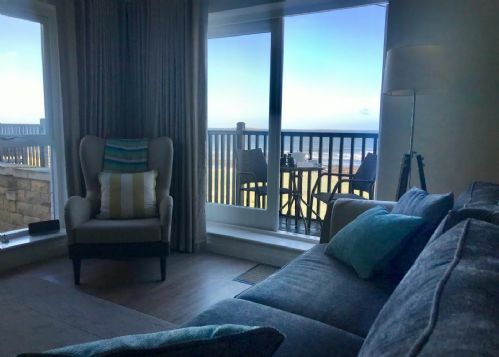 Upper Deck is a wonderful apartment to stay in - high specification, really comfortable, and fantastic views from the front balcony out to the Farne Islands. A good base for exploring this coastline. Excellent information provided for guests, including maps and the all important access times for Holy Island! Everything you need in the kitchen to enable self catering. Easy to look after and keep clean and good security for the building. Wonderful view from sitting outside, beautiful place to watch the sunset. Thoroughly enjoyed our week in first class accommodation. many thanks. Lovely apartment and wonderful area of the country. A short stay for us this time but had good weather, walking & visits. 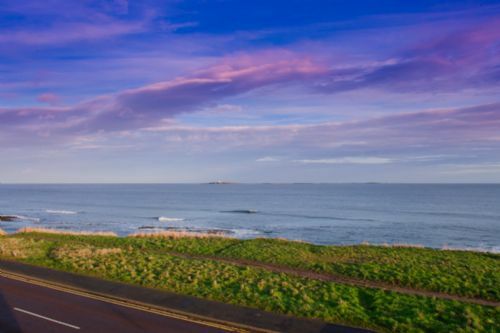 Apartment really well sited with wonderful views over the Farne Islands and those sunsets! Thank you. Very enjoyable week spent in superb location and accommodation. First class apartment and amenities. The apartment was very lovely and the weather was awsome.The location is perfect and it was easy to get everywhere. The view is beautiful and the beach amazing. Highlights Alnwick Castle and Farne Islands. A most enjoyable stay in this comfortable & well equipped apartment. We have done lots of walking and admired the scenery on this beautiful coast....we are surprised that the area is so little known as a holiday destination - but perhaps it's better that way! A great location with stunning views....loved it! A lovely week. The apartment was great - thank you. Highly recommended - a boat trip to the Farne Islands, a walk along the beach to Bamburgh, a trip to Holy Island. And finally, just watch the sun go down across the sea is a wonderful glow. Lovely stay - perfect location and excellent apartment. We will recommend to friends and hopefully we'll be back! Fabulous week in a fabulous apartment. great location for coastal walks from the door - the walks to Bamburgh and Dunstanburgh were particularly good.Farne Islands are a must but take a hat to protect yourself from the angry birds!! Ship Inn greta for dinner but remember to book ahead. Spice House also reccommended. Looking forward to our next visit!! We have been very impressed with the lovely apartment and the great views. What a fantastic area, lovely beaches, wonderful weather (a bonus!) and so many different places to visit. The apartment has been very thoughtfully furnished and we have had a great time. What a privilege to be the first entry! We have enjoyed a wonderful two weeks in this amazing apartment. What a perfect location in the most spectacular part of the Northumberland coastline. The weather has been very mixed but we have walked every day, mainly on beaches and coastal paths. Plenty of lunches out - the usual venues: The Ship at Low Newton, The Jolly Fisherman in Craster, and new to us, The Joiner's Arms in Newton by the Sea. And of course must mention Swallow Fish in Seahouses! Front line property with views to the Farne Islands and Bamburgh Castle, from its location in Seahouses. Also walking distance to village amenities and the harbour. 3 night weekend break released, this would not normally be available. Fantastic vlaue for this sea view apartment sleeping upto 4. 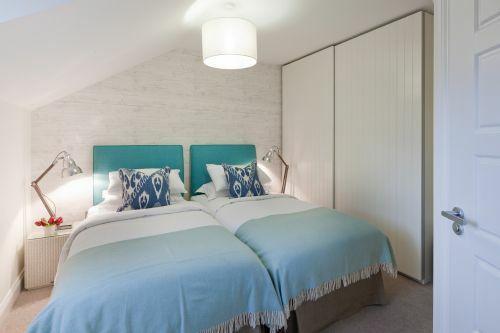 2 flexible bedrooms (can be made as doubles or twins) & 2 ensuite bathrooms. 1 small non shedding dog very welcome. Wi-fi & secure parking for 1 car. 4 night mid-week break released, this would not normally be available. Fantastic vlaue for this sea view apartment sleeping upto 4. 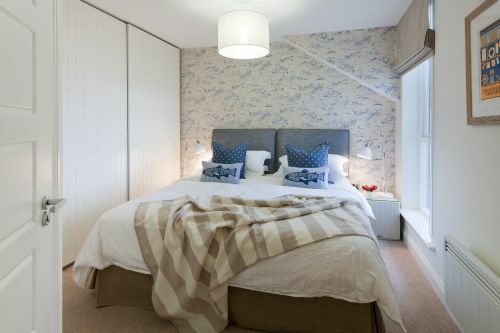 2 flexible bedrooms (can be made as doubles or twins) & 2 ensuite bathrooms. 1 small non shedding dog very welcome. 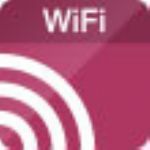 Wi-fi & secure parking for 1 car.